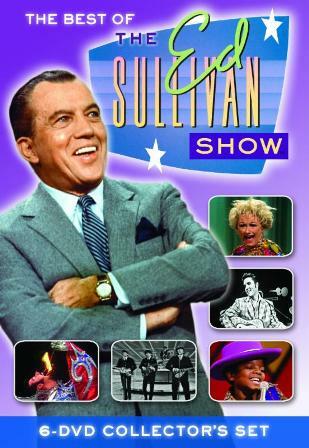 We’re happy to partner with StarVista Entertainment/Time Life to offer a giveaway opportunity for The Best of the Ed Sullivan Show DVD, which includes six DVDs for over seven hours of content. Three lucky readers will win the newly released DVD. The Best of the Ed Sullivan Show is currently available to own. Three will win The Best of the Ed Sullivan Show six-disc collector’s set on DVD. Enter using the Rafflecopter form below (U.S. entrants only, no P.O. boxes) by June 1, 2015. Rare appearances by Barbra Streisand, Bobby Darin, Sammy Davis, Jr., Marlon Brando, Humphrey Bogart, Fred Astaire and more! Rock and roll’s greatest, including Elvis Presley, The Beatles, Buddy Holly, The Rolling Stones, The Doors, The Byrds, Janis Joplin and more! Comedic talents Milton Berle, Carol Burnett, George Carlin, Rodney Dangerfield, Phyllis Diller, Jackie Gleason, Bob Hope, Richard Pryor, Joan Rivers, the Smothers Brothers, Flip Wilson and more! The best of the daring acrobats, challenging balancing acts and dexterous jugglers-selected by Ed as his personal favorites! Zippy the roller-skating chimp, Heidi the Talking Dog, the legendary Lipizzaner stallions and more than a dozen other amazing animal acts! Over 2 hours of special bonus features, including the only surviving on-camera interview with Ed and Sylvia Sullivan, exclusive interviews with Milton Berle, Phyllis Diller, Shari Lewis, Johnny Mathis, Michelle Phillips, Joan Rivers, Smokey Robinson, Señor Wences, Flip Wilson and more. Three lucky winners will be drawn at random and notified via email. The winners will each have 48 hours to respond to our notification with their complete name and U.S. mailing address (no PO Boxes). Failure to respond within 48 hours will result in forfeiture and another winner will be selected. For complete giveaway rules, click here. When I was a kid I always watched “The Mike Douglas Show.” I remember when he had John and Yoko on as co-hosts. It was a great show. Laugh In – sock it to me! I think the best was The Smothers Brothers Comedy Hour. I love the Carol Burnett show. My favorite would be the Carol Burnett show. I love the Ellen show. My favorite of all time is I Love Lucy. I love the Carol Burnett Show! I like the Carol Burnett show.